Reading List #4 | emma etc. As you know, I haven't been reading much lately. But I am going to change that. I'm planning to read A LOT throughout December and try to rekindle my love for a good book. Here are the books that I currently have and are on my list to read! Everyday by David Levithan: I have actually finished this one already, because I was eager to start reading. It only took me a few days to finish this one and it's easy to see why. I found this book interesting (with it's concept, and the ideas about our universe/world it expressed), it was 'easy' to read in the sense I read it quickly, and it was beautifully written. A lot of books can be dull, but I found this one to be meaningful and interesting. The Queen of the Tearling by Erika Johansen: This is one I've just started. I'm excited to read something a little different than I usually would. I think it's sitting on the verge of being classed as young adult and adult fantasy. From reviews or ratings I've seen so far, I'm hoping this one will be good. I'm really hoping it's going to be an exciting read with a strong female lead. Apparently it's turning into a movie as well, but I won't look up the cast just yet because I don't want to start imagining the protagonist as someone else's idea. The Invasion of the Teraling by Erika Johansen: This is the second book of the Tearling series. I don't know too much about it and haven't really read the blurb because it might contain spoilers since I'm only on the first. Sophie kindly gave this book to me to review for her blog, so that was my incentive in getting into the first one now. 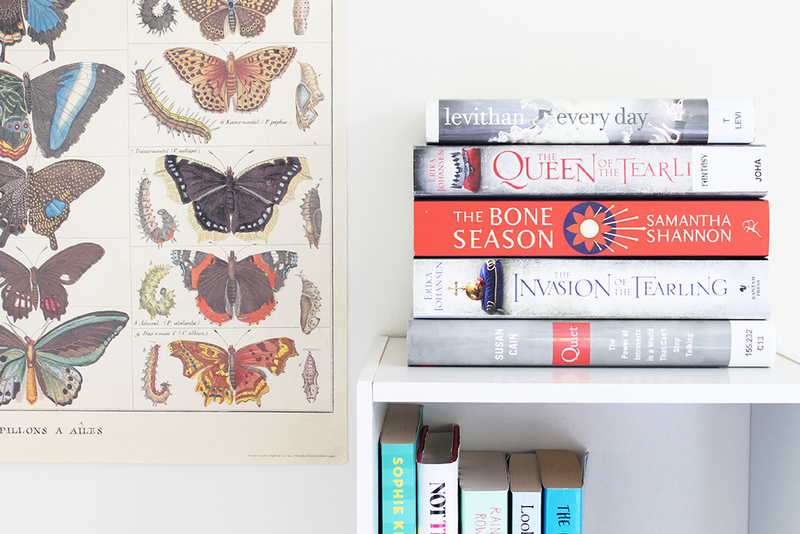 The Bone Season by Samantha Shannon: Once again, a book Sophie gave me for review. The Bone Season sounds really interesting. The basic premise is a nineteen year old girl who works in the criminal underworld of 'Scion London' and her job is to break into other people's minds to find information. Oh, and it's the year 2059. I'm excited to venture into slightly more fantasy/dystopian worlds right now. Quiet: The Power of Introverts in a World That Can't Stop Talking by Susan Cain: I'm increasingly interested about the dynamics of introverts/extroverts. I'm an introvert, and I want to find out more about the concept, as well as what are the perceived benefits of being an introvert and an extroverted world, I suppose. I've been thinking about doing a blog post about this kind of thing, so maybe reading this book will spark some kind of idea. Who knows if this will be a good book, but hopefully I'll get something out of it. What are you reading right now/do any of these books look good to you?